– Visibility into the customer journey will continue to evolve so companies can provide proactive recommendations and communications for front- and back-office functions across the company, not just for the contact center. – We’ll improve on how we identify and measure journey success so that we can replicate the successful CX across the business. – We’ll use customer journey analytics for predictive routing of customers. – We’ll personalize routing based on business rules and customer data. Customers prefer to authenticate once, and effortlessly, in a journey. Adoption of verification methods like biometrics (voice biometrics or eye or fingerprint sensors on mobile phones) will grow, with verification becoming increasingly passive from the customer point of view, without reliance on interrogatory techniques. – Customers will be better informed—proactively—using notifications tied to their channel preferences. – Customers will choose channel preference based type of interaction. For example, they’ll be able to select a text message for doctor appointment reminder, but a personal call from their doctor for test results. – With increased personalization, customers will need to supply personal information. To address privacy concerns, they’ll need to “opt-in” to such personalization efforts. Business will find ways to encourage participation, even if it’s only making sure the customer understands through clear communication that they’ll benefit from a better CX. – Expect chat to be transformed with chat bots and other forms of artificial intelligence. – Integrate social media into journey management to put agents with the right skills in place to respond through social channels. – Peer networks in some industries can provide service. These can be enhanced by use of social media and “ambassadors” to assist customers. – Agents can use information from social channels to assist customers. For example, they can use YouTube or other external content on how customers are using a product or solving a problem. – Serve customers better by arming agents with a unified omnichannel desktop. – Use recording and speech and text analytics to discover gaps in agent knowledge, whether they’re participating in voice, chat, email. Use it to better train agents. – Move to modern self-service options instead of old school, high-effort, impersonal IVR. Instead, offer the option to get wait times for channels from voice, text, email, web chat, to video chat and let customers choose self-service channels based on their preference. For example, give them the choice of chatting now or waiting 20 minutes for a call back. 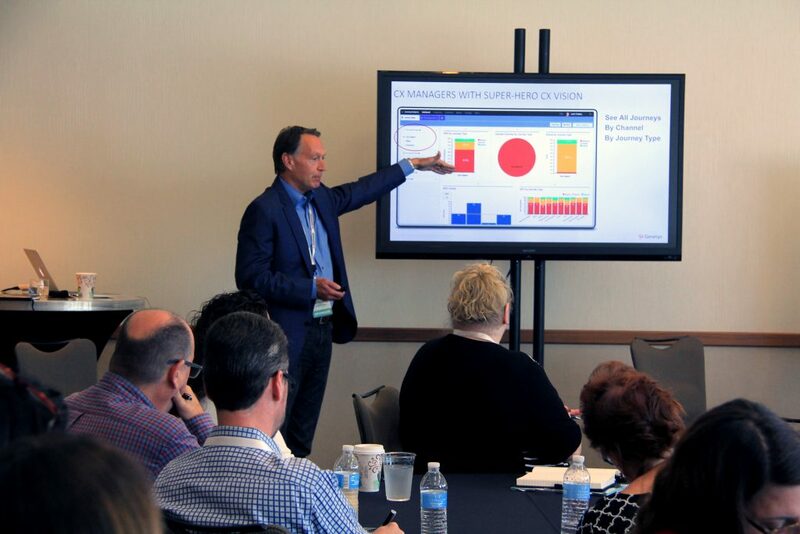 CR Summit Austin was an opportunity to share information, and gratifying because I heard clearly that so much of what Genesys is working with partners and customers to achieve is of great interest to global leaders in CX. Interested in where your company stand in CX innovation? Check out The Omnichannel Customer Engagement Playbook.